We believe in a holistic approach to learning which ensures parents and teachers work effectively together to support pupils’ learning. “The days that make us happy make us wise” is the Fyling Hall school motto. We believe that children need to be happy, and that when they are happy they enjoy school and they enjoy learning. to develop agility, physical co-ordination and confidence in movement. To achieve this, we aim to provide a broad and balanced curriculum that will enable each child to develop emotionally, socially, physically and intellectually to his or her full potential. Each child is unique and valued as an individual, with different learning styles and experiences chosen to best support their learning. Each child can develop at his or her own pace. Small class sizes enable us to facilitate this. In the Junior School we aim to provide a broad and balanced curriculum that will enable each child to develop emotionally, socially, physically and intellectually to his or her full potential. Each child is unique and valued as an individual, with different learning styles and experiences chosen to best support their learning. Small class sizes allow each child to be challenged to learn at a pace which is demanding but appropriate to their individual needs. Our curriculum goes beyond the limitations of the National Curriculum, offering children access to additional content that is both challenging and engaging. For computing, drama and sport we have free use of the senior school facilities. The state of the art IT suite and newly refurbished theatre are used as teaching spaces, as well as the science laboratories. Upper key stage two students also have the benefit of specialist subject teachers for art, science and IT. Being familiar with the teachers and surroundings ensures a seamless transition when it is time for our pupils to move to the senior school. We use the National Curriculum, Key Stages 1 and 2, as the basis for the curriculum offered and the children are assessed at the end of each Key Stage using externally set but internally marked SAT materials. English, Mathematics, Science, Art, Music, French, History, Design & Technology, R.E., Computing, Games, swimming, Drama, Geography and Forest School. We have eight lessons each day. On Thursday pupils travel by coach to the local pool for swimming. Between formal Key Stage assessments, QCA optional tests and NFER Cognitive Abilities Tests are used in addition to standardised spelling and reading tests. Key Stage 1 children take home a reading book each day whilst Key Stage 2 children are given more formal prep tasks each day. They are also expected to spend time on independent reading. We have the freedom to create an integrated and exciting curriculum based on the three main strands of English, Maths and Science. Our only limit is our imagination. Music and drama are a central and delightful part of Junior School life. We put on our own productions in the theatre, with the nativity play always an annual highlight. We give regular concerts for parents, friends and the local community. Our singers, young instrumentalists and verse-speakers also take part with pleasure and much success in the Eskdale Festival of the Arts. 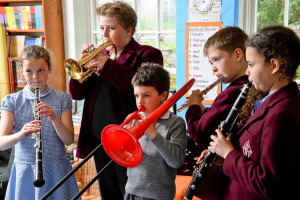 We have a junior choir, orchestra and brass /wind band and a variety of instrumental ensembles who often perform music especially arranged for the current array of talent by our music staff. Individual tuition by expert peripatetic music teachers is available for a wide range of instruments. French is introduced from Reception, with pupils learning to sing French songs, count and greet each other in an informal, fun atmosphere. Both the junior and senior schools put a strong emphasis on sport. The younger years spend ninety minutes every week either outside or our specially designed sports hall, and the whole school goes swimming at Whitby Leisure Centre every Thursday morning. Upper key stage two do their games lessons alongside the some of the senior school pupils, in order to introduce them to playing competitive sports (such as rugby and hockey) as part of a team, and also to integrate them into the wider school community. The children also have the option of riding lessons with our dedicated riding instructor on the school ponies. In the summer term, we have our own Junior School Sports Day and Swimming Gala. Parents are invited to both events, and are always well attended by cheering supporters! The house system that operates in the school encourages friendly competition between the children, as well as giving them a supportive team atmosphere in which to compete. In the Junior School we feel it is important to take learning outside the classroom. Maximising our stunning location and using it as a learning resource as well as curriculum linked trips provide inspiration and are both key to our pupils’ school experience. We have a wonderful outdoor classroom in our own forest school, where the pupils experience a whole range of activities. The whole junior school visits the forest school every week. This has had a very positive effect on the children’s relationships and self-confidence.